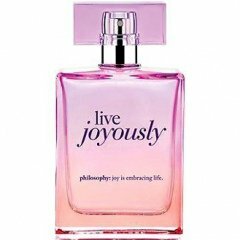 Live Joyously is a perfume by Philosophy for women and was released in 2014. The scent is floral-fresh. It is being marketed by Coty. The first thing you will encounter after spraying is a short guest performance of a spicy citric breeze of essential mandarin oil. Then the floral-fresh component unfolds, which lasts for many hours. The Patchouli note is rather hidden, does not get its chance. All in all a cheerful, young fragrance for the warmer season, which does not rub off. Actually quite nice for those who like it flowery. This reminds me a bit of the NR signature Egyptian musk with a lighter sillage and packing less overall punch. Patchouli is noticeable but not offensive. The peony is a soft cloud and there must be some other floral notes floating around in the background. This is another daytime, fresh scent in the genre of "Lovely" by SJP and the whole Narciso Rodriguez line. If you really like this scent, I would recommend SJP or NR and this will undoubtedly disappoint those looking for an all day companion. Like most Philosophy fragrances, this will dissipate down to a faint whisper after the first hour, unless you have layered it with the matching shampoo, lotion, body soap and reapply with the travel pen...as they are hoping you will do. I give this a 1/10 for originality, 2/10 for longevity and 3/10 for sillage. If I liked this smell at all I would get it, because it's the sort of scent that is great for travel in all of its economical travel ready formats. But, alas...I don't...so, I won't. Write the first Review for Live Joyously!